Jumbo Empanadas: How Did That Get There? Don’t let the chocolate bars in the picture fool you, there is no chocolate in these muffins. Don’t let that dissuade you from making them though, they’re honey bran muffins with blueberries and they complete any breakfast. 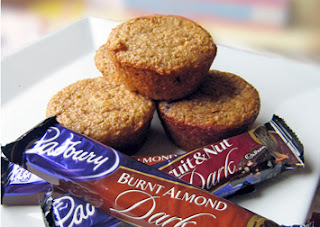 The reason for the chocolate bars is that they’re what I found while making these muffins. I reached into the baking cupboard to pull out the brown sugar and three chocolate bars fell out. I didn’t put them there and I wasn’t supposed to find them either. My Dad put them there, somehow thinking he was hiding them. When I find things like chocolate ‘hiding’ in the baking cupboard I can’t help but laugh. This is the last place in the house that anyone should try to hide something from me. I am the primary baker in the house, (I wanted to type only, but I thought that might garner some indignation from Mom, the baker who hasn’t actually baked anything in years…) and as such, I use that cupboard on an almost daily basis as it houses such essential ingredients as baking powder and soda, sugar, vanilla, dried fruit, etc… And yet this is a common hiding place for Dad’s chocolate stash. He knows that if he leaves the chocolate laying out in the open, I’ll eat it but doesn’t think I’ll find it if it’s tucked behind the brown sugar. In reality, the only person this chocolate remains hidden from is Mom, the other ‘baker’. I find this funny to no end. But even if you don’t share my sense of humour, I encourage you to bake these muffins. They come together in minutes and everyone loves a warm treat from the oven with their breakfast. Tip: If you make them with blueberries you’ll be forgiven for stealing chocolate from the secret hiding spot in the baking cupboard. Add dry ingredients and stir until moistened. If you’re using blueberries, add them now. Bake at 375 °F for 15-20 minutes. **This post also appears at the Just Baking site. Posted by Brilynn at 10:02 a.m.
aww your father is so cute! Hmm... burnt almond chocolate? That sounds amazing! Did your dad find that chocolate in Canada? Chocolate aside, I'm definitely going to give your muffins a try. I've gotten into a habit of baking for breakfast every weekend, so I'm always on the lookout for new things to try, especially if I can justify them as healthy. Ha ha! That is too funny. What was he thinking, trying to hide chocolate from you in the kitchen?? Your muffins look delish and blueberries definitely put them over the top. Awesome - my thought would be to not tell him you found it (well, too late for that)... so that whenever you need chocolate, you know where to get it without tearing the house apart searching. That is good for several laughs! I'm sure he has some kind of logic to it but it escapes me also. Blueberries will most always gain forgiveness for eating a chocolate stash - - Oh maybe that was the intent it was a bribe to get you to bake. Well at least your dad tried..ha!! this muffin is the favourite in the famiy. and i always keep a batch in the freezer, gone within days! Well, I sure am glad to see I'm not the only stasher of chocolate around the house. My dear hubby will eat every last bit of it- so I resort to hide it! :) (Sometimes I stash it so well I can't remember where I put it!) The muffins look great- and healthy too! Oh, and by the way- you better give that chocolate back!! LOL- I can relate to this. I found so many "treasures" when I had to clean out the cupboard for the move.